Sempervivum (sem-per-vye-vum), houseleeks, liveforever and, hen and chicks; Crassulaceae Family. 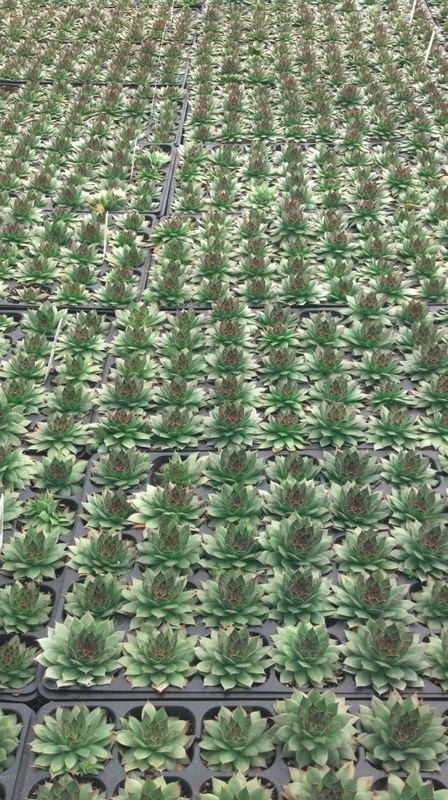 Sempervivum are evergreen perennials of the Old World, consisting of a rootstock topped by a tight cluster of mostly incurving, fleshy leaves, forming an almost globular rosette. Short runners, growing out from the root, terminate in smaller duplicates of the central leaf tuft. Clusters of white, pink yellow or purple flowers on stems grow out of the centers of the leaf rosettes. Sempervivum succeed in any well-drained, moderately fertile soil, preferably in full sun, although most kinds will tolerate light shade. Primarily grown for their foliage, they make good plants for rock gardens and are particularly suitable for narrow rock crevices and chinks dry walls as long as there is enough soil to accommodate the roots. Easy to grow in full sun to partial shade, and well-drained soil. While they are adaptable to a variety of soil types, they will do best in coarse, sandy soil. Although Semervivums can tolerate frosty conditions, excessive watering, fertilizer or humidity may cause rot. Plant in rock gardens, alpine gardens, troughs and containers. Though hens will die after flowering, they will produce numerous chicks to take their place. To propagate, simply split off the chickens from the parent plant and transplant them. Providing contact with the soil should be sufficient for transplanting, since Sempervivum root readily. If a groundcover effect is desired, space plants close together because they grow slowly. Deer and Rabbit resistant. Attributes: Border plants, Containers, Evergreen, Ground cover, Salt Tolerant, Small / Miniature, Easy to grow.